On a lighter note, Thursday was brilliant: I’d booked the day off so that C. and I could have some “us” time. We took F. to the nursery and then went for an amazing English breakfast at The Victorian House (where I’d never been before). Afterwards, we did some (Christmas) shopping and enjoyed how quiet the city centre is on a weekday morning. We agreed that we will make this a regular thing as we’ve definitely been having nowhere near enough time for each other lately. 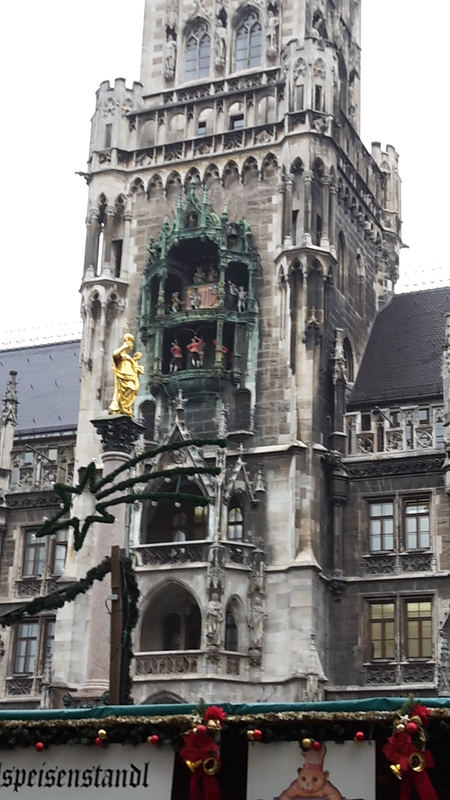 We also watched the chimes in Munich’s Marienplatz and for the first time ever I watched them until the very end and saw and heard the owl that hoots in the end to complete the spectacle. Friday was a busy day at work and I was seriously worried how I’d manage to fit in a “first”. As so often, however, chance jumped in an presented me with a pretty cool one: As I had another one of my coughing fits, a colleague recommended home-made cough syrup: cover half an onion in a few spoonfuls of honey and wait till the honey has pulled some of the juice out of the onion. I made some in the evening and although I didn’t feel like it helped me much, strangely it actually tasted quite nice. Yesterday, I read a mummy magazine for the first time: “Brigitte MOM”. It’s quite entertaining and not as baby-focused as the magazine I normally read. And I like the fact that it’s honest about targeting mothers – the other magazine calls itself “ELTERN” (parents) but really is written mainly for women too. However, I think now that I’ve become somewhat used to being a mother I think I might stop reading any parent magazines and just go back to reading about other things – the parent ones seem to constantly repeat themselves and don’t really tell me anything new. Today I made peanut butter cups (or rather hearts) for the first time. I’ve got these silicone moulds for making pralines so it wasn’t a lot of work at all, really (well, the washing up is still waiting to be done). 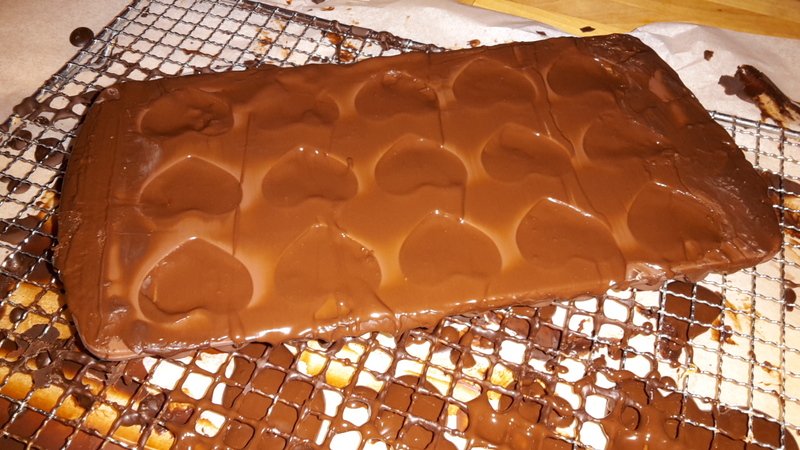 I’m still waiting for the chocolate to go completely hard so I can’t yet report what they taste like, but I’m sure it’ll be lovely. How did I not think of this sooner? They will make a lovely addition to our selection of home-made biscuits and chocolates at Christmas. 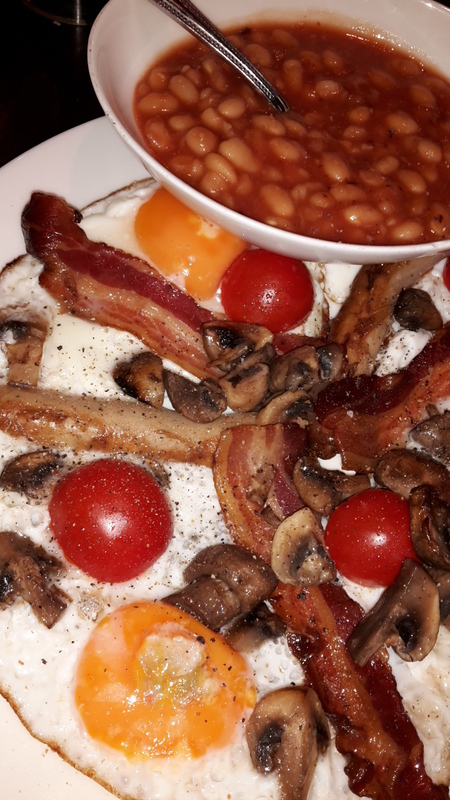 < Previous Day 309 – guilt-free crisps!